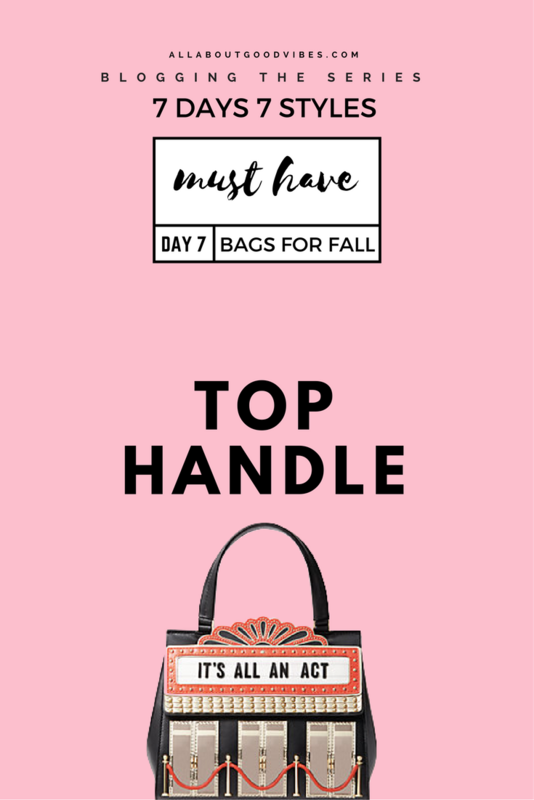 Must Have Bags for Fall | 7 Days 7 Styles | Day 7 Top Handle | I know you can #handle this! Babe, I know you can handle this! 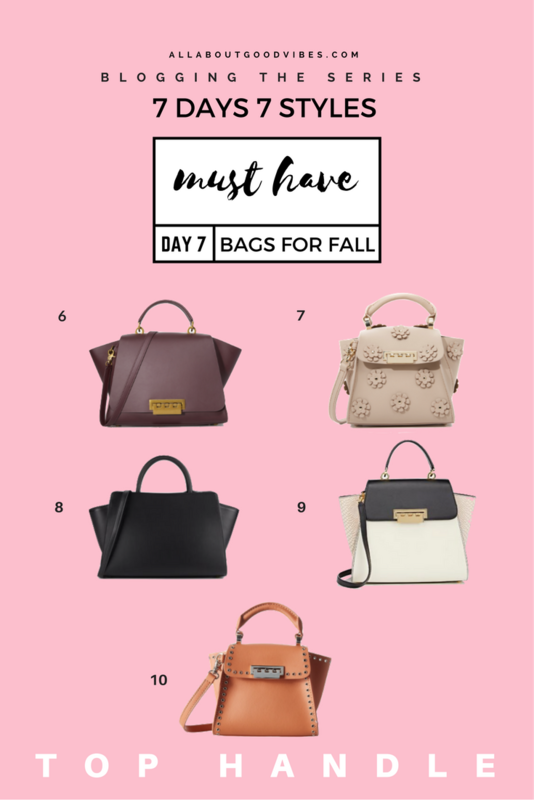 I can’t believe today is the last day of the 7 Days 7 Styles, Must Have Bags for Fall. 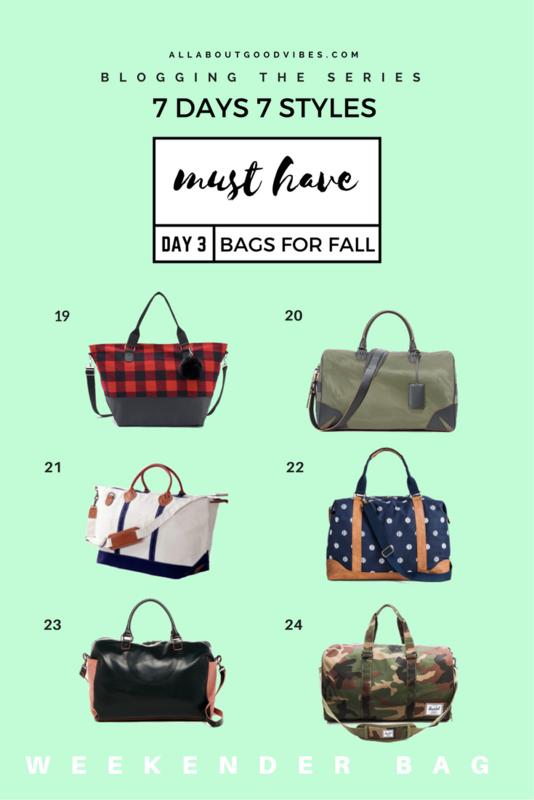 I’m hopping you got tons of ideas to go hunt for your new bags this Fall. I’m so THANKFUL that you’re coming back everyday to read my posts! Thank you so much my love! Please stick with me, there is a lot more to come! Since you’re being so good, I decided to announce my Next Month Giveaway today! but right now keep on guessing until the end of today’s post! I know you can #handle this! Right? 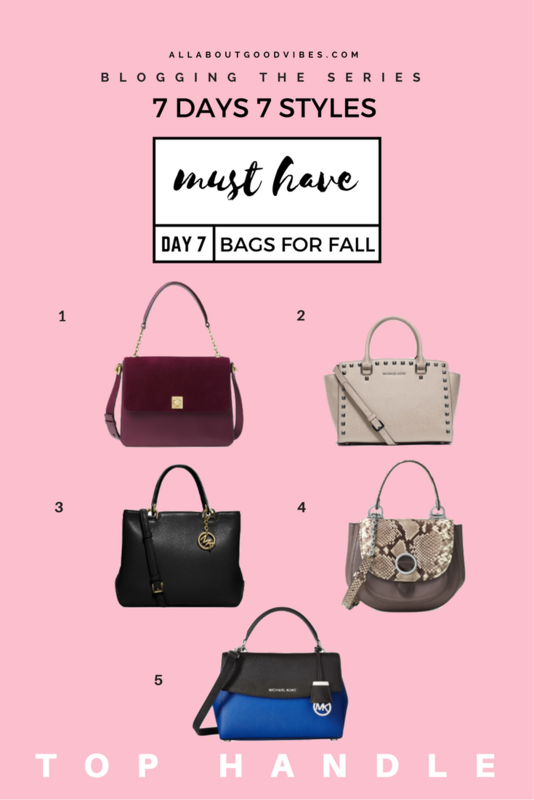 Before I show you all the bags, I want to talk a little bit about my three favorite brands of Handbags. Just some very quick, but short sweet words. Luxury, high quality but affordable. You can carry Michael Kors pretty much anywhere you go. The bag is not going to make a big statement but it will give you a sense of style and luxury. I love how structured and iconic their bags are. Vibrant colors, good quality and affordable. On sale very often too! When you carry it, everyone will know who’s your favorite designer that day! Playful, fun and always makes you excited for the upcoming holidays and occasions. They never run out of ideas to surprise you with a huge selections of cute stuff like these new Dress The Part bag and clutch collection. It makes me want to go buy some popcorn and go straight to the movie theater right now! Like I promised, I will tell you about the next months giveaway! Something that starts with C and ends with G! I will have the picture and more details on October 1st. But no need to wait that long, hope over here and enter! Don’t forget to come back for more details! 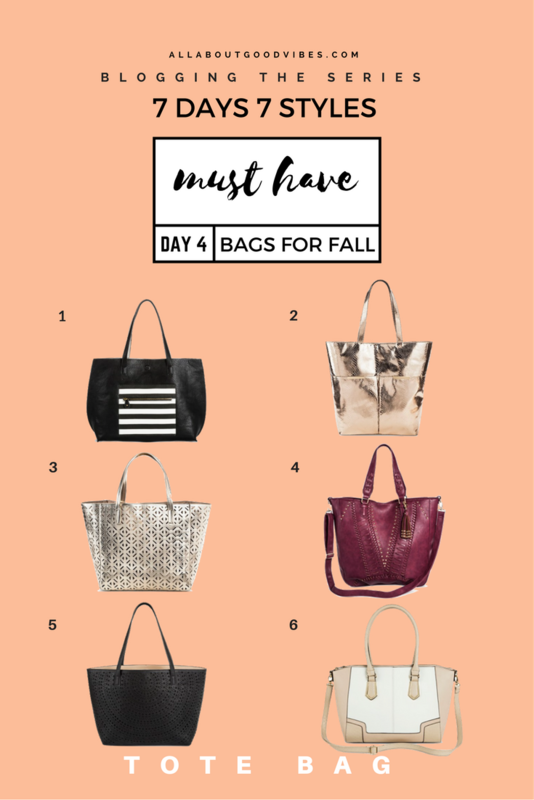 So after 7 days of the series, which style of bag is your favorite? I really can’t decide, I just love them all! 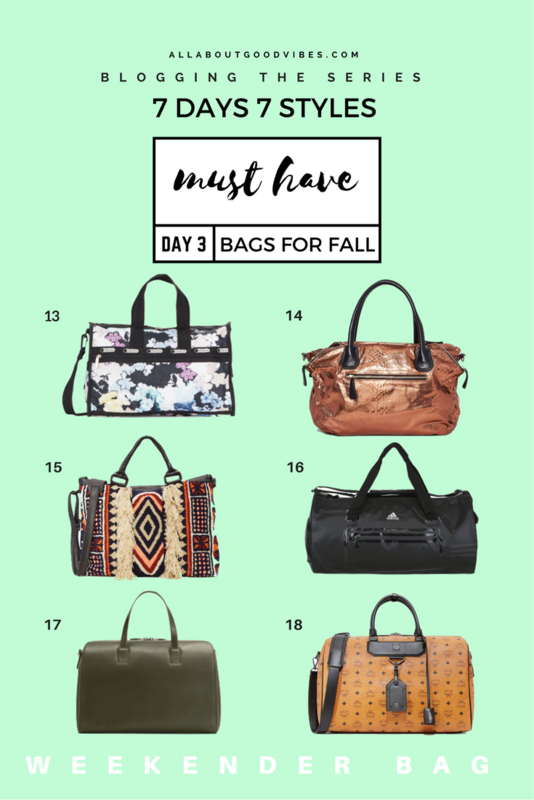 I’m a bag addict! Lol! Let me know about you down below! Have a great day and a wonderful night, my love! 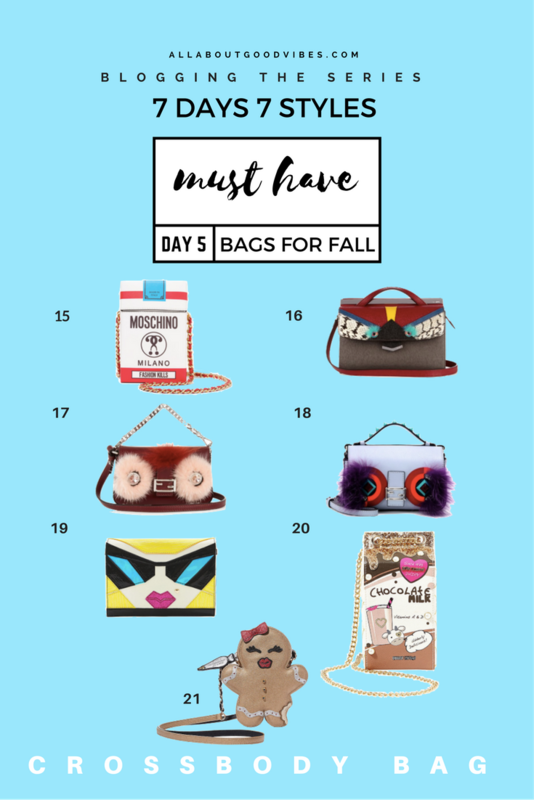 Must Have Bags for Fall | 7 Days 7 Styles | Day 6 Wallet on a chain #WOC | Grab and go! Grab and go! I’m so busy! Hi there! Today I’m not going to waste your time talking about something that’s not as important as today’s topic! 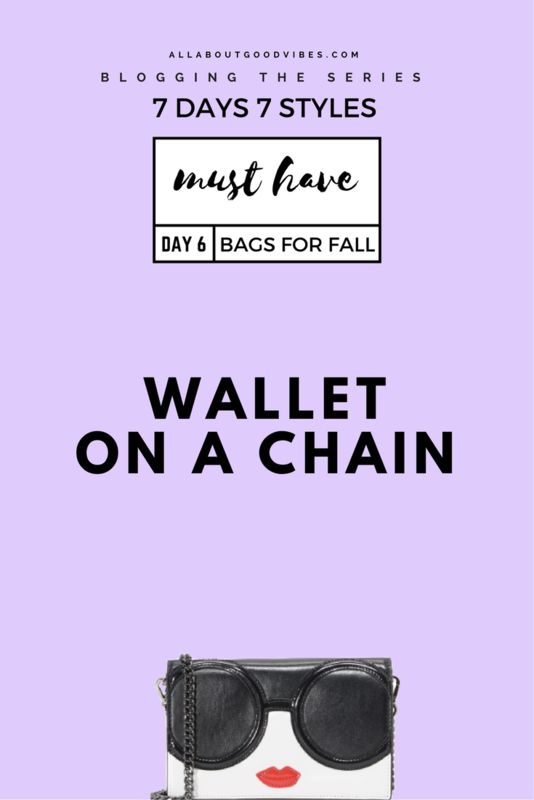 I’m going to show you one of my favorite bags at this moment, right after this sentence ends, Wallet On A Chain. The beauty of this style of bag is that they mostly come in a three-in-one style. 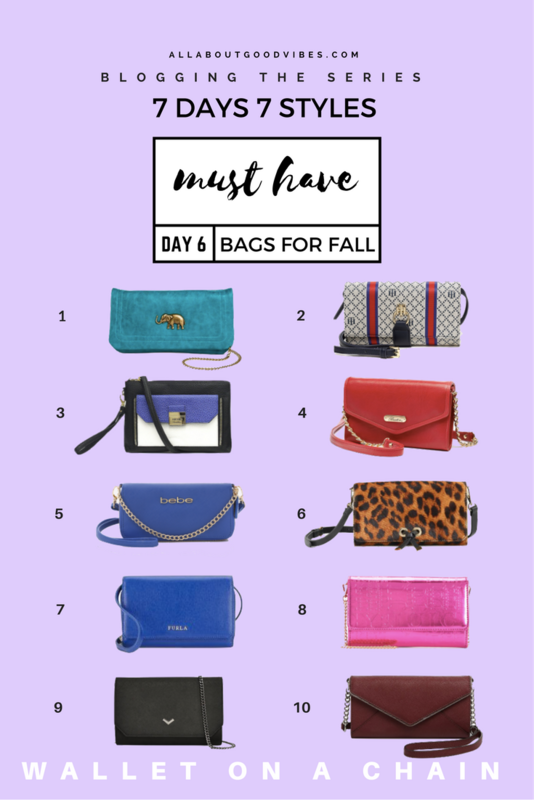 You can use it as a streamlined wallet to a weekend-ready cross body or carry it as a day-to-night clutch. Here’s what I’ve got to show you for today and by the way, they are for all budgets! 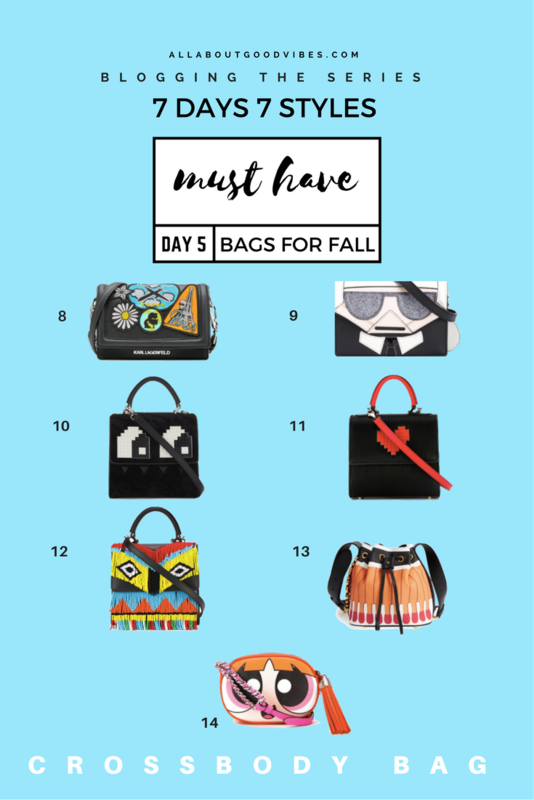 I like #13 ALICE + OLIVIA STACE FACE the most! See you tomorrow my love! 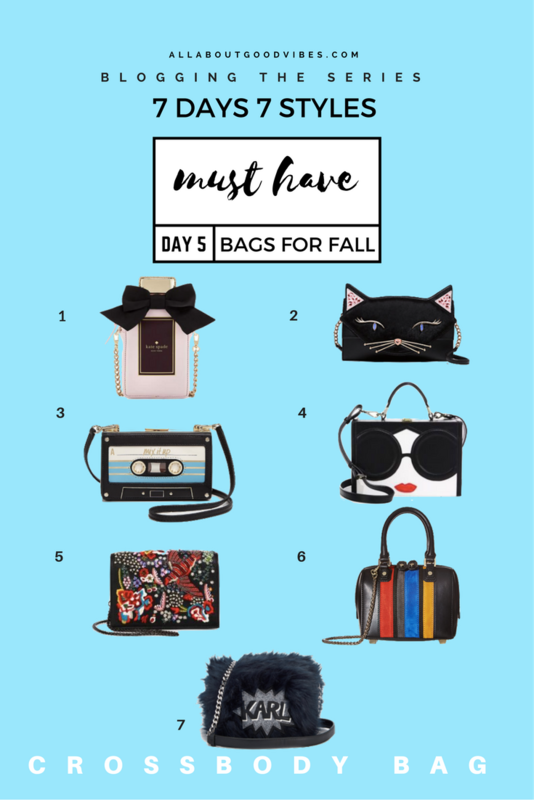 Must Have Bags for Fall | 7 Days 7 Styles | Day 5 Fun Crossbody Bag | Let the FUN begins! Party time! Let the Fun begin! How was your weekend my love? I hope you had a wonderful time! Today is the beginning of the week, I want to start it with some good news! 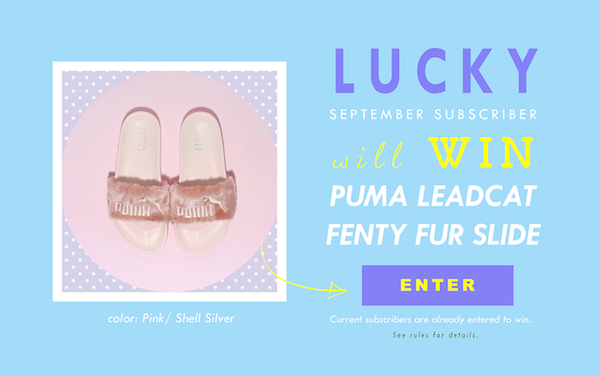 So the good news is everyone who is already a subscribers to my blog will be entered in next month’s, October giveaway automatically! Yay! You don’t need to answer any questions like this month! I got a lot of good answers from this month #PUMAFURSLIDE giveaway. I have to go through all the answers. This should be a lot of fun. The winner will be announce on October first via Facebook and Instagram. Make sure you’re follow me @thevibescloset. Also if you’re not sure that you’re already on my email list or not, you can go ahead and put your information here. I’ll let you know about the prize in a couple days! 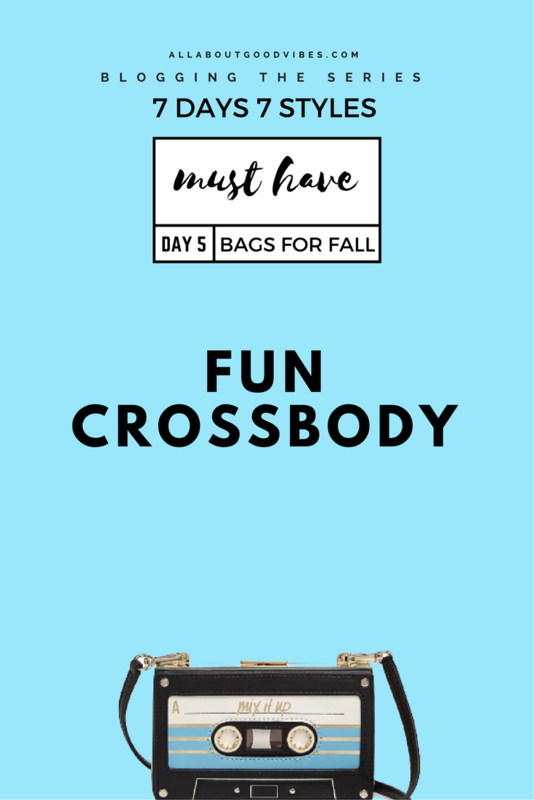 The prize starts with the letter C and ends with the letter G.
Why don’t we get into our topic today, “Fun Crossbody Bag”. I don’t know about you but for me every time I see some bags that have their own personality I just want to own them all! They just make me smile so big! I think it has to do with my childhood memories and my personality. I remember, my hobbies when I was little were drawing, painting, singing and playing musical instruments. I think that was the time when my imagination went wild and never went back to normal! Not only that, people who really know me, who I can call them, my BFFs, they all say I am a very friendly and super funny person. Maybe that’s why I love something fun! FYI, I might seem very quiet and aloof ‘cool and distant’ to some people! …just for those who are more weird than me! lol! I hope you have fun looking through all the bags today like I did. If you can design your own FUN bag, what would it be? and what will you name it? See you tomorrow my love! Get some rest and enjoy the rest of your day! 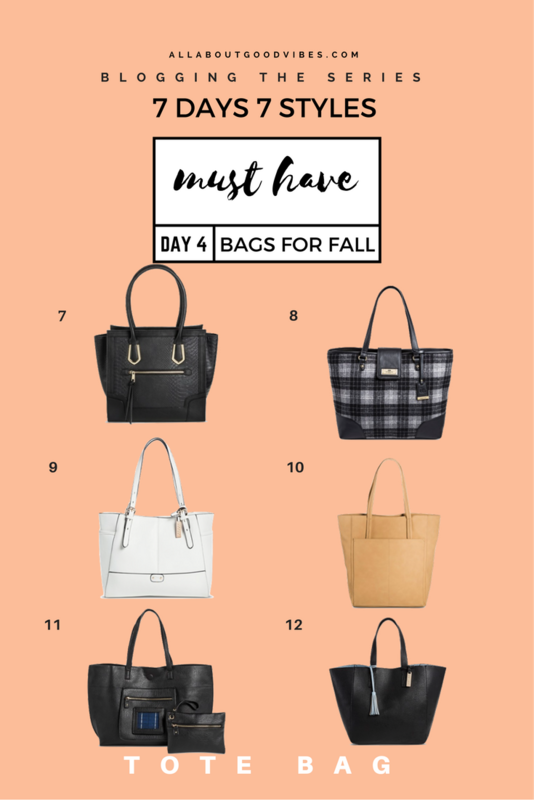 Must Have Bags for Fall | 7 Days 7 Styles | Day 4 Tote Bag under $40 @Target | All I need is my tote & butter! All I need is my tote & butter! Go big or go home! The bigger the better! I’m sure you’ve heard these phrases before! I’m using them with one style of a bag that I’m going to talk to you about today. Tote bag is one of the most convenient and useful bags to have. When I say “convenient” it might sound weird, but it is the most convenient bag in terms of space and how easy to access. Its size is so big that you can fit your whole house in, I’m exaggerated here a little!, you know what I mean! 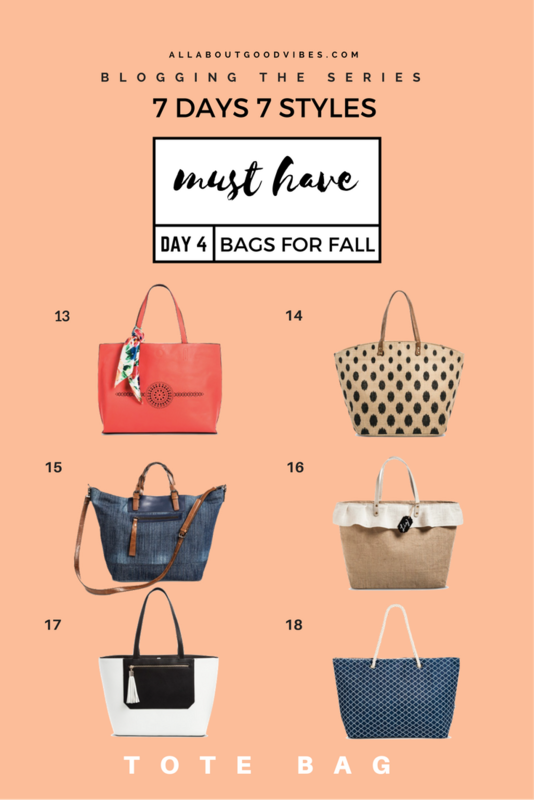 Small items like lipstick, cellphone, pens and sunglasses to bigger items like magazines, iPads and laptops, you can fit them all in this style of bag. 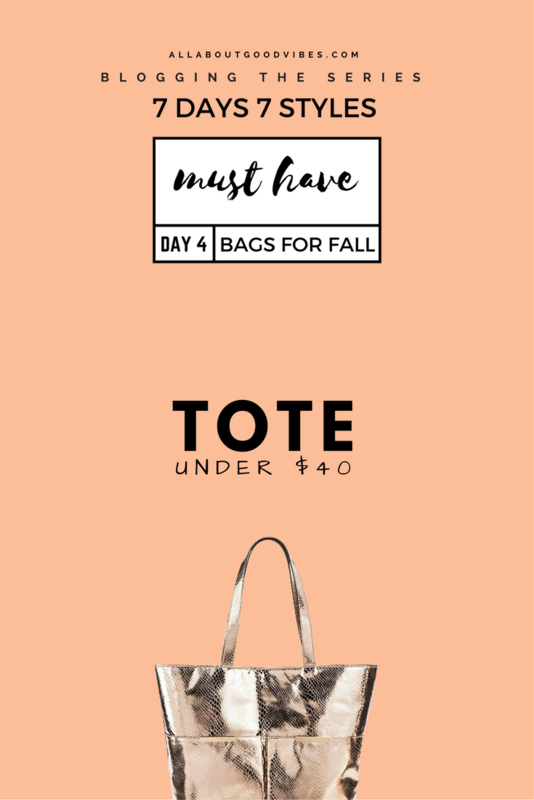 Tote bag was one of my favorite bags when I was in college and still is now that I’m a mother and I need to bring a lot of baby stuff with me. When I was studying, I could fit my textbooks, laptop and many more stuff that you can think of. I remember one incident, my friend asked me do I have the stapler? Sure enough I had it in my tote bag. Another time someone asked me for a scissors, who would carry scissors to school right? Yep, I had it in my bag! See what I’m talking about, it’s so convenient! You just have to make sure you put all things in there, they won’t come with the bag though! Lol! 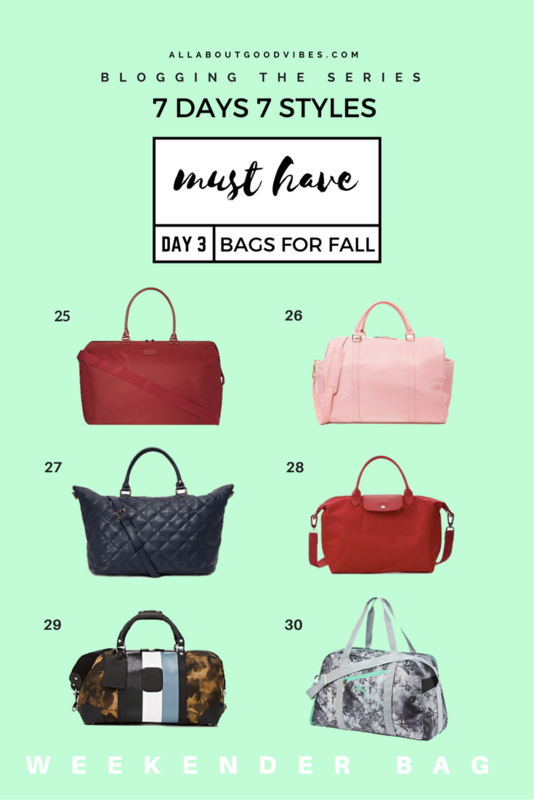 Because every lady needs at least one tote, today I figured why not take you to go shopping at Target and find the right bag that are under $40. 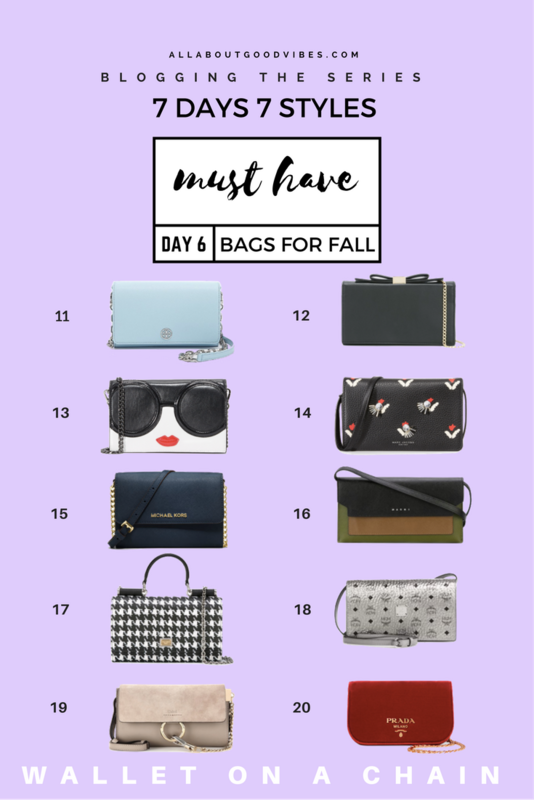 All of them are cruelty free vegan leather so you don’t need to feel bad after looking through my list! Before we look at the bags I want to remind you about this month’s giveaway that will end tonight. If you haven’t yet already, don’t forget to enter here. The winner will be announced on October 1st, via Facebook and Instagram. Thank you for your participation! Good luck my love! Do you prefer Vegan leather or real leather bag? and how much would you spend on a tote bag? I’ve good news about next month’s giveaway on tomorrow’s post. Don’t forget to come back and check it out! See you tomorrow my love! Enjoy the rest of your weekend! 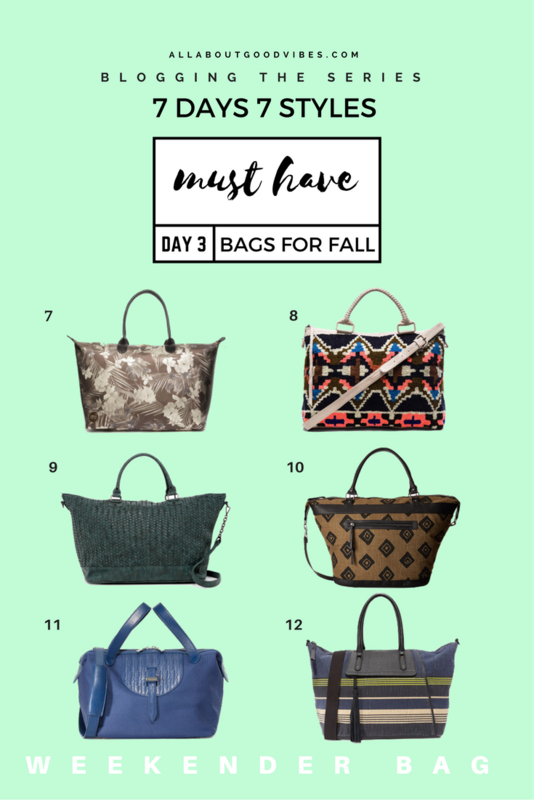 Must Have Bags for Fall | 7 Days 7 Styles | Day 3 Weekender Bag | I need a vacation! Recharging yourself before you need it, is the best way to keep your mind and body balanced. Sometimes we work so hard, care about other so much and forget to take care of ourself. It’s time to put everything aside and enjoy your life, give yourself a break, you deserve it! Stop saying ‘LATER’ and then wait until its too late because you may not be capable to do the things you where planning to do. Nobody knows the future! Live your life as if everyday is your special day! Life is too short to be unhappy so enjoy every second you have now! Deal? When it comes to relaxing I love to get a spa treatment and a massage but it seems so long since I had my last aromatherapy session. I’ll need to get one today! Not from a professional, I’ll probably do it by myself and with a little help from my husband. You should do it too! No more waiting! Everything that can make you happy, start doing it today because HAPPINESS is the key to being HEALTHY! So let’s get healthy by being happy together! Weekend getaway is another way to go for some relaxations. You might want to check out some beautiful resorts near you and go stay there for a night or two. 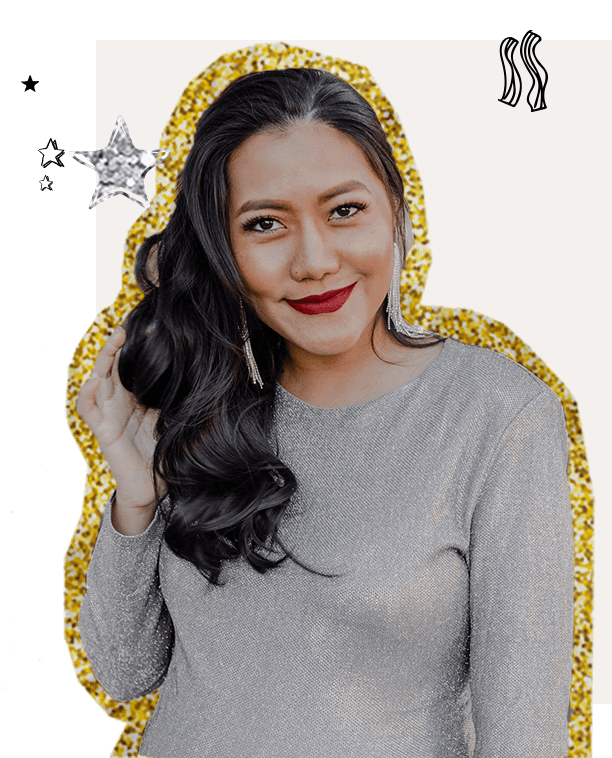 Just to get away from your usual places, this way will help you take your mind off all worries and lift off some tough responsibilities you’re dealing with. Not a bad idea, huh? 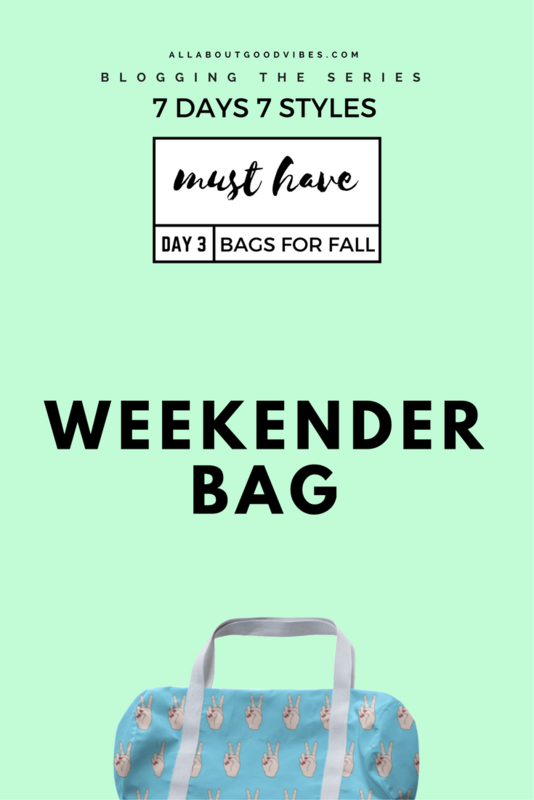 In case you need a new getaway fabulous bag with you on your upcoming trip, I got you covered my love! 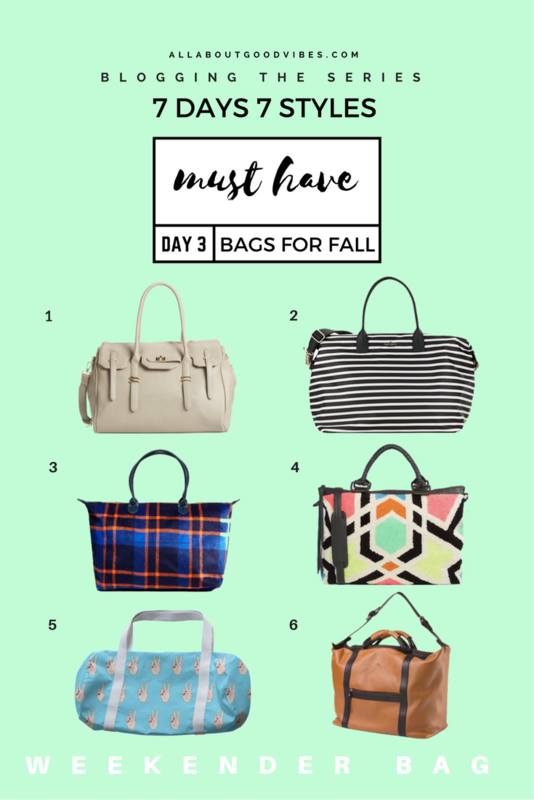 Today I’m sharing with you 30 cool, cute, small but big enough bags for you on your lovely weekend getaway this Fall! I hope you find this helpful! 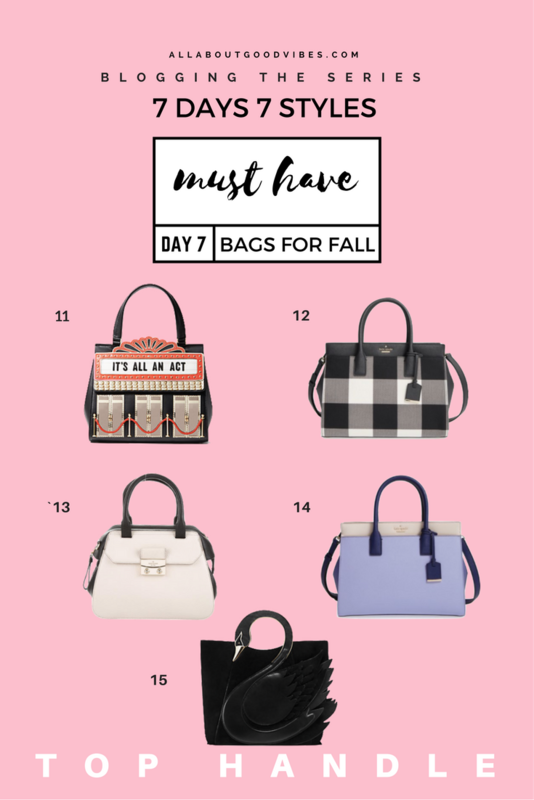 Which bag is your favorite? and Where’s your dream vacation destination? See you tomorrow my love! Have a happy and relaxing day!